Two caregivers staff our child care center from 8:30 a.m. to 12:30 p.m. each Sunday. Nursery/preschool care is available for children from infancy to age five. Our nursery is located downstairs adjacent to the Fellowship Hall. Any of our staff or members would be happy to guide you to the location of our nursery. At Rose City Park Presbyterian Church, our worship service is one where multiple generations and families share in the worship hour. Rather than separating children off in their own classes, we include children age four and older in our worship services. Please stop by the “children’s table” in the upper narthex to grab a children’s bag and activities to provide your family with activities during the worship service. Intergenerational services can be important times of spiritual growth for adults and children alike, as they build trusting relationships, practice community ethics and values and create a safe, familial space in which all feel they belong. Why do we have Intergenerational Worship Services? To honor children and youth as integral parts of our church family. To include children and youth in the life of the church as a method of teaching community ethics and values. To allow busy families a chance to spend meaningful time with their children and to encourage continued conversation and exploration outside of the worship hour. To encourage interaction and the building of trust between older and younger members of our church community. 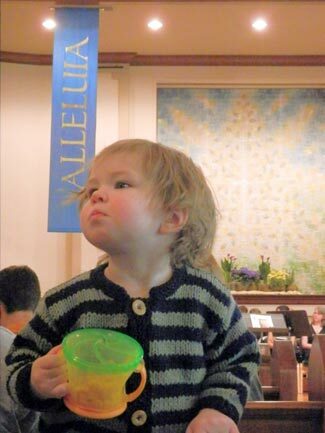 To give younger members experience participating in our liturgy, so they can understand our rituals, values and norms within worship. To help children and youth begin to serve as active members of our church family. To give ALL members a place where they feel safe and where they belong! This is a group for middle and high school students that meet weekly following Sunday worship. A rotating schedule of weekly activities creates a balanced program of crafts, outings, Bible study, fellowship and mission opportunities. The Sunday bulletin and church newsletter contain information on scheduled activities.